Finally reunited with the man she loves, Maria agrees to become his wife. Little does she realise this will catapult her into the cream of Christmas Island society. Now a lady of leisure with servants to cater to her every whim, all Maria wants is to spend time with her new husband, learning to ride a motorcycle and sneaking off for a romantic swim. One thing’s for certain: Maria is in for a bumpy ride. When I read the first three books in the Turbulence and Triumph series, I have to admit to being a tad disappointed with the ending of Book 3. Not because the series was let down in any way shape or form – but because after William and Maria’s difficulties and obstacles in the first three books, I was disappointed not to see more of their happily ever after. But now, oh, joy of joys, Ms.Carlton is back with the fourth book in the series, and I can happily say I was delighted with the entire book from start to finish. In this book, we pick up from where we left off, with the newly-married couple settling into life together on Christmas Island. Blissfully happy with her new husband, Maria does have a number of obstacles to overcome – not least of which is dealing with the rules and regulations surrounding Christmas Island society and her role in it. Watching Maria try to get used to the social restrictions placed upon her was entertaining and beautifully written by Ms. Carlton. Another highlight of this series is the way Ms. Carlton has captured the historical accuracy of Christmas Island life during the early part of the 20th century. It’s is apparent from her writing and the descriptions she has given, that Ms. Carlton takes her research seriously and this shows in the beauty of what she writes. I thoroughly enjoyed this book, love the characters and highly recommend this series to other readers. 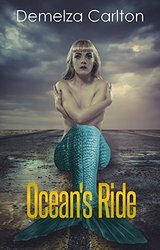 I received an advanced copy of Ocean’s Ride from Ms. Carlton, but would have happily purchased it, as I had done the first three books in the series.